Megan and I recently took a brief vacation to visit our old friends Blair and Kristen Richardson in Alberta, Canada. Blair, General Partner of Bow River Capital, sits on the Massey Quick Advisory Board and has been a source of sound advice since we first met in 1987. 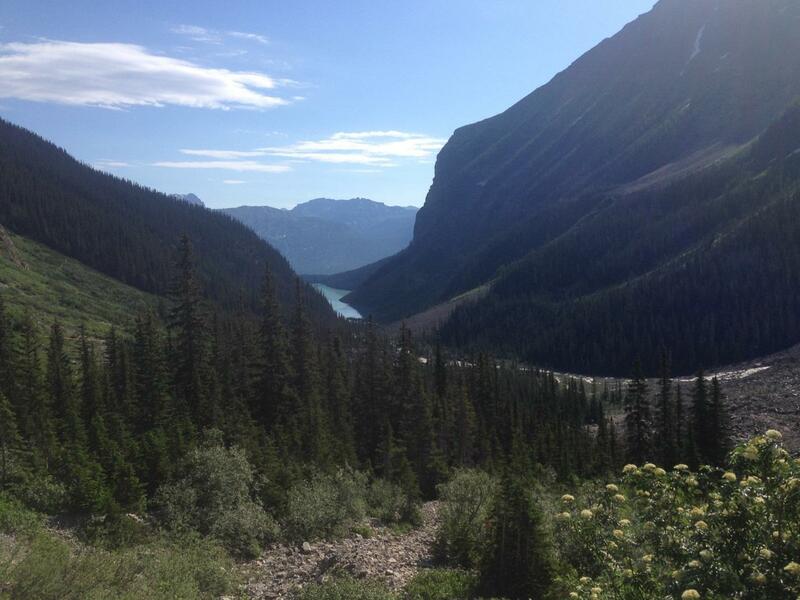 Banff National Park is magnificent. We took the opportunity to do some hiking each day to absorb the beauty of our surroundings. 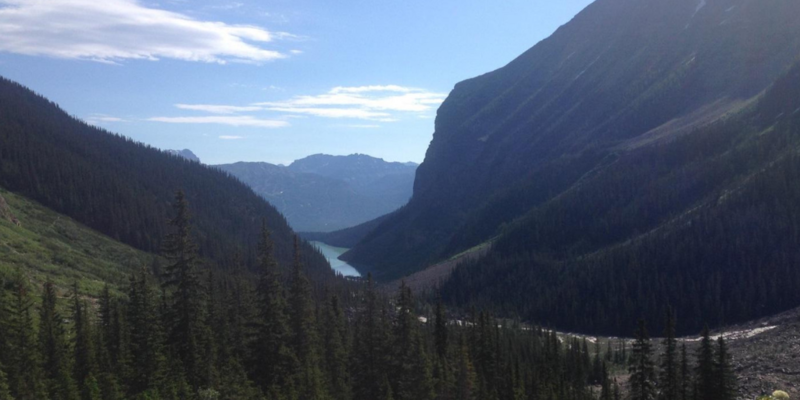 Our most memorable hike was a 10.6km trek from the base of Lake Louise to the Plain of Six Glaciers. Along the way we had fantastic views of Mt. Lefroy, Mt. Victoria and the Victoria Glacier. When we reached the summit we enjoyed some homemade soup and gluten free brownies at the historic Plain of Six Glaciers Tea House. It was a memorable experience. If you haven’t visited that part of the world it is well worth the trip. During our flight home we loaded up iPhoto with all of our pictures and talked about how nice it was to get away, spend time with friends and enjoy such a beautiful national park. Most of the photos were of the breathtaking views we experienced on our hikes. As I started to transition my brain back to work I realized there was another kind of hike I had to start thinking about. When will the Fed begin to hike interest rates and how will that influence our clients’ portfolios? The Federal Reserve Bank has been implementing a near zero interest rate policy for nearly six and a half years. Extraordinarily low interest rates, combined with several rounds of quantitative easing, helped pull the economy out of the depths of the financial crisis. This unprecedented strategy was successful and is now being used as a blueprint in the Eurozone and Japan to help spur their economies along. Three questions remain: when will the Federal Open Market Committee (FOMC) begin to hike the Fed Funds rate, how quickly will subsequent rate increases come and what impact will this have on various asset classes? Some of the equity and bond market volatility we have seen in 2015 has resulted from speculation on rates. When we discussed this in our investment committee meetings I told my colleagues I found this perplexing, particularly for the equity markets. Higher rates would indicate the economy was in better shape which should flow through to top line growth, particularly for companies not facing headwinds from a stronger dollar. As a result, our research team is watching Fed Funds futures more closely to gauge sentiment about the actions of the FOMC. CME Group Fed Watch (www.cmegroup.com) extrapolates Fed Funds futures pricing into implied probability bands for interest rate hikes. July 2015 futures indicate a 56% probability that the FOMC will raise rates by .25% at their July 29th meeting. September futures imply a 69.2% probability of a rate increase of 25 bps or more at the September 17th meeting. December 2015 futures show a 91.1% chance that the Fed Funds rate will increase by .25% or more by the December 16 meeting date. The unemployment rate is at a seven year low of 5.3%. The labor participation rate is near a four decade low of 62.6% but Fed minutes seem to indicate this is not being placed into strong consideration. The personal consumption expenditures price index, the Fed’s preferred inflation measure, increased .2% in May alone on a year over year basis. This would indicate that inflation, excluding food and energy, has crossed the 2% threshold. Home prices, as measured by the Case-Shiller Index have increased steadily since they reached their low in 2012. Housing starts are also up meaningfully since their low in 2009. The next series of interest rate increases should be measured and thoughtful. We have never been in a zero rate policy period for so long. We have never embarked on quantitative easing programs before. As a result of these unprecedented policy decisions we have seen multiple unintended consequences in the capital markets. Our best guess is that the FOMC will feel their way through this slowly and deliberately. One must ask “What are the possible unintended consequences of unwinding these unprecedented policy decisions?” The one major factor that might expedite interest rate policy to higher levels is an increase in the rate of inflation and the acceleration in wage growth. How might this impact the capital markets? Monetary and fiscal policies have had a profound impact on the equity markets over the past six years. U.S. equities have tripled since their March 2009 lows. The total capitalization of the S&P 500 has grown from roughly $6 trillion to $19 trillion today. Earnings doubled during that period from $417 billion to $1.04 trillion in 2014. During that time the Federal Reserve Balance sheet has ballooned from $1 trillion to $4.5 trillion. Seasoned strategist Byron Wien, vice chairman of Blackstone, estimates that three quarters of the capital injected into the economy through QE went into financial assets pushing stock prices up and pushing yields on fixed income instruments lower. In his market commentary published in late May of 2015 he pointed out that “…the Fed contributed almost $3 trillion (some may have gone into bonds) to the $13 trillion rise in the stock market appreciation from the 2009 low to the current level, earnings increases explained $9 trillion (1.5 X $6 trillion) and other factors accounted for $1 trillion. You could argue that the monetary stimulus financed the multiple expansion in this cycle.” Where does the domestic equity market go from here after the end of quantitative easing and a zero interest rate policy? The current perception is that interest rate hikes are bad for equity markets. This is not necessarily true. Barron’s recently published a table showing that in most instances, the S&P 500 continued to rise after an initial rate hike. We have to remember that many of these rate hikes began at higher interest rate levels than exist today. We believe there is plenty of cushion before higher rates begin to impact equities. While we are probably overdue for some sort of correction, equity valuations are not stretched. The earnings yield on the S&P 500 (index earnings divided by the price of the index) is currently 5.5% based on 2015 earnings estimates, nearly identical to where it was when the market bottomed in 2009. The free cash flow yield on equities is 4.5%. These compare favorably with the 10 year Treasury yield of 2.5% and the yield on cash at close to 0%. Dividends and share repurchases totaled approximately $900 billion in 2014 and are on track to exceed $1 trillion in 2015. Merger and acquisition activity has picked up markedly this year both in terms of the number of announced deals and dollar volume. Many of these transactions are accretive. With the punchbowl removed, further advances in equity prices will have to be driven by earnings. While the stronger dollar has provided headwinds for multinational corporations, some offset will be found in lower input prices from basic materials and the decline in energy prices. Productivity gains continue and wage growth remains muted. We remain constructive on U.S. equities for the next three to five years and would consider using any correction of 10% or more to rebalance equity positions to the top of the range of asset allocation guidelines. As mentioned previously, the Eurozone and Japan have both embarked on their own versions of quantitative easing, using the United States as a blueprint for success. In October of 2014 the balance sheet of the European Central Bank stood at €2 trillion. Today it stands at €2.35 trillion. They still have plenty of room for expansion. In the fall of 2014 the EURO STOXX index reached its low with a total market capitalization of €8.1 trillion. Since then it has increased approximately 30% to €10.5 trillion. In local currency terms the index is up over 15% in 2015 despite the recent crisis in Greece. After the run up, the index is trading at a forward price to earnings ratio of 15.5. Expectations for the corporate sector have been low but earnings have led the way. 58% of the Dow Jones Stoxx 600 companies recently beat earnings estimates – the best in four years. Top line growth in Europe has been strong with 73% of companies beating sales estimates. A stronger dollar makes European goods more competitive to global consumers and economic growth and industrial production has turned positive. The combination of a QE led rally and improving fundamentals is making Europe a more attractive place to invest. When our Fed raises interest rates the dollar is likely to remain strong. We have recently been identifying managers and passive ETFs that hedge currency. The bank of Japan’s balance sheet has increased from ¥132 trillion to ¥327 trillion since the beginning of 2012. The market capitalization of the Tokyo Stock Exchange has increased from ¥254 trillion in the beginning of 2012 to ¥587 trillion today. Japan is a large importer of oil and gas. Blackstone estimates that the recent drop in energy prices is the equivalent of 2.1% of Japan’s GDP. Return on equity for Japanese companies has risen to 8.3% from 5.7% two years ago. In addition to aggressive QE the government is implementing regulatory reform to reduce cross shareholding and the hoarding of cash. Exports are benefitting from a weaker Yen. Share buybacks in Japan reached a record in 2014 and are expected to increase. Like Europe, the story here is driven by both QE and stronger fundamentals. We have some exposure to Japan through our active global managers but these recent changes warrant further attention. Once again, currency hedges are likely to increase total return for dollar based investors. 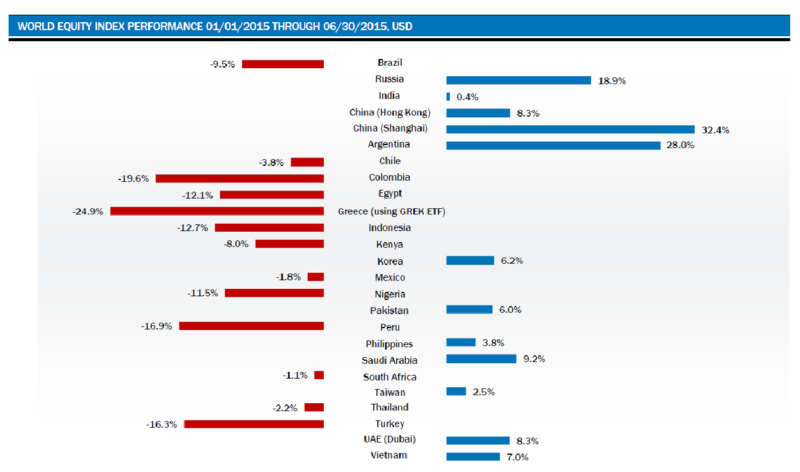 Emerging markets are lagging developed market indices year to date. After staging a rally in the first four months of the year we have seen a meaningful pullback from late April’s highs. Emerging markets is a broad term. The dispersion between the performances of single country indices within the EM is massive. Courtesy of Prince Street Capital, one of our core managers in emerging market equity, the following chart illustrates these dispersions year to date through June 30th. Emerging markets come in all shapes and sizes but China remains the bell cow. The catalyst for the sharp decline in the index during July was the massive decline and subsequent volatility in the Chinese A share market. After reaching a high on June 12th the Shanghai Composite lost 30% of its value in a matter of weeks, wiping out $3.9 trillion in market capitalization – 14 times the annual GDP of Greece. Like many other market dislocations leverage was at the core of the problem. New account openings and margin borrowing had begun to hit record levels. Margin balances surged from RMB400 billion (USD$64 billion) to RMB2.3 trillion (USD$370 billion). It was estimated that the “shadow banking” system provided another RMB2 trillion (USD$320 billion) at its peak. To further exacerbate the situation by the 10th of July over 1,300 Chinese companies, or approximately 47% of the market, had halted trading in their shares. The Chinese government then stepped in taking unprecedented steps to revive the market. Their actions included suspending initial public offerings, relaxing margin restrictions, allowing investors to pledge their homes as collateral for margin loans, suspending all short selling and banning major shareholders, executives and directors from selling shares for 6 months. Chinese monetary policy actions included lowering interest rates to record levels and simultaneously reducing reserve requirements. Concerns remain about China’s growing pains but economic expansion should remain in the 6.8 – 7% range for the foreseeable future. Should GDP growth falter further and if the equity markets continue their sharp decline we may see some contagion creep into the developed markets. The shakeout in China is creating opportunities in other emerging markets that declined in sympathy with no change in underlying fundamentals. We remain constructive on emerging and frontier markets for the long term but active management is imperative. As we’ve said many times before we were way too early to shorten duration and improve credit quality in our clients’ fixed income portfolios. With interest rates at a generational low and credit spreads extremely tight our philosophy was to remain conservative and live to fight another day. If rates are on the rise we may finally be positioned properly. One must remember the Fed only controls the short end of the yield curve. Market participants control the rates on longer dated instruments. Our best guess is that in the early days of Fed hikes the yield curve will likely flatten. Steepening will occur when we see an acceleration in inflation – both consumer prices and wages. That will be the time to begin to extend duration. It isn’t too late to refinance your mortgage if you haven’t done so already. Our financial planners can help you run the numbers. We remain concerned about the liquidity in the fixed income markets. As we saw for a brief period in the fourth quarter of 2014 when everyone wants or needs to get out, bids disappear. We are also concerned that many investors have chased yield in some instruments they don’t fully understand. Much of this capital is in daily demand instruments, primarily ETFs and mutual funds. It is possible we may see a longer term repeat of Q4 2014 particularly in areas like high yield and fixed rate preferred if everyone heads for the exit at the same time. Because of regulatory reform traditional market makers cannot dedicate the same amount of proprietary capital to help maintain orderly markets. They are no longer the source of price discovery. We foresee that those with cash and the ability to maneuver, primarily hedge funds and private equity managers, will be the ultimate beneficiaries of these dislocations. We have maintained a significant amount of exposure to floating rate securities through special situation fixed income funds and middle market lending partnerships. Most of these securities float off of LIBOR. 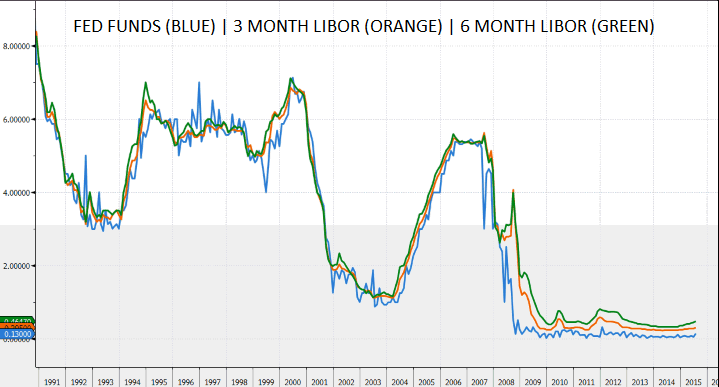 A series of rate hikes by the Fed should benefit LIBOR based floaters. As the following chart shows there is a high correlation between LIBOR and the Fed Funds rate. During the QE driven rally in equities for the past 4-5 years hedge fund returns were disappointing on a relative basis to long only equities. Very few funds lost money, but the opportunity cost was hard to stomach. Who needs portfolio protection if the stock market is going straight up? With the United States serving as the risk market of choice for global investors through the end of 2014 an immense amount of “risk on” money flowed into equity index funds. This made shorting, and stock picking in general, very difficult as the distinction between strong and weak fundamentals within specific companies and sectors was quite narrow. Performance turned on a dime in January of 2015. Year to date the HFN Fund Aggregate index (a representation of all strategies) was up 3.01%. The HFN Equity Hedge Index was up 5.12% at the end of June. This compares to performance of 1.23% for the S&P 500 Total Return Index. Six months doesn’t represent a trend but it does begin to validate the asset class in a post QE environment. Our analysts are receiving quite a bit of inquiry on hedge funds in mutual fund structures. They have done a considerable amount of work in this area but have only found one or two funds with experienced managers and time tested track records that begin to make sense to us. We are also watching our long short credit managers more closely after witnessing the performance hits many of them took from the Q4 14 liquidity driven sell off. Most of them took the opportunity to refresh their portfolios during the tumult and have been some of our better performers in 2015. We still believe hedge funds should be an aspect of portfolio construction. As we learned in 2008 they can perform an important role during market dislocations. Fees are still high, especially for the best and brightest talent, but we view them as an “insurance premium” that hopefully pays the investor a positive return over a market cycle. We remain at or above policy targets in this asset class. We continue to find interesting private equity transactions and funds. Our preference is for strategies that have a specific niche as opposed to the larger name brand funds. Our expectation is that there will be some return premium for accepting illiquidity. The most successful investors we have seen in this sub sector invest some portion of the portfolio in privates annually, avoiding the risk of being outside of a strong market cycle. Several of our long standing managers will be raising new funds over the next 24 months. Portfolios that can withstand some illiquidity should be invested in this arena. Don’t be afraid when the Fed initiates their first hike in interest rates in more than 9 years. Fiscal and monetary policy brought stability and growth to the United States. The same policies are now being implemented by Europe and Japan. Easy monetary policy remains the norm throughout the world with the possible exception of the United Kingdom. Domestic equities have had a great run but so have the underlying fundamentals. The U.S. may no longer be the risk market of choice but corrections should be viewed as a buying opportunity. International equities are becoming more interesting and portfolios should have some exposure here. In a perfect world quantitative easing in the Eurozone and Japan should bolster their equity markets too. China is still the bell cow for emerging markets but slower than expected GDP growth would not be positive for the global economy. We are still urging clients to keep duration short and credit quality high in their fixed income portfolios as we move closer to higher interest rates. Floating rate strategies remain attractive. The end of the QE era should be positive for alternatives as correlations between sectors and stocks continue to decline as flows into index funds wane. As always, we contend that asset allocation and periodic rebalancing remain the most important ingredient to investment success. Please feel free to reach out to us with any questions or comments you may have. Enjoy the rest of the summer months and if the spirit moves you take advantage of some of the beautiful trails in your part of the world to do some hiking of your own.